If you don't keep stock of your products, you may need to trigger purchase orders on each sale you make. Thanks to being a fully integrated solution, Odoo lets you do that easily in just one step. Open a product form and, under the inventory tab, tick the routes Buy and Make To Order. Don't forget to also set a vendor under the Purchase tab. The Inventory, Sales and Purchases modules have to be installed in Odoo for this feature to work. Create a new sales order with your product. When you confirm the order, a delivery order is created with the status Waiting for another operation. A new RfQ will automatically be created in your Purchases module. Note that you can see for which SO this RfQ has been created thanks to the Source Document field, visible on the RfQ. 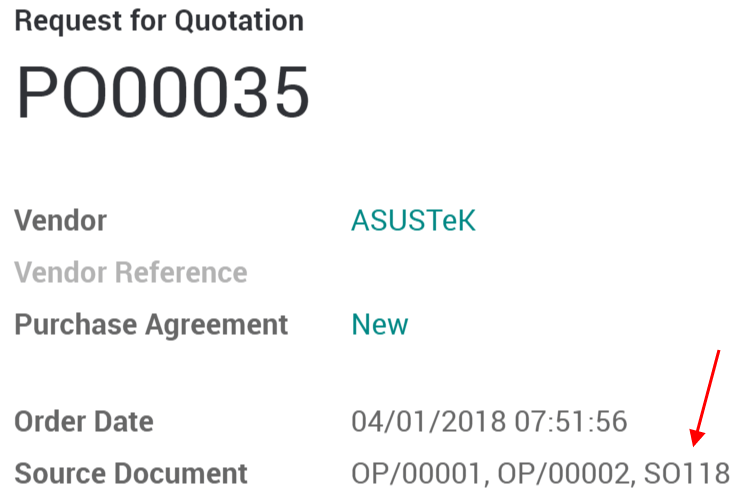 When you confirm the RfQ into a purchase order, a receipt is automatically created and directly accessible from your purchase order with the use of the Shipment button. You can validate the receipt of your products. When you will go back to the delivery order, you will see that the products are now ready to be shipped. As long as your RfQ is not confirmed, Odoo will keep adding PO Lines automatically under it.